Description: Stainless steel cable is 1/16" diameter x 11 foot roll. 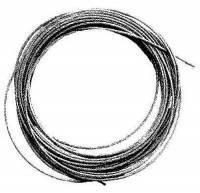 Description: Stainless steel cable is 3/64" diameter x 100 foot roll. 3/64" Brass Cable x 11 Foot Roll. Description: 11 foot roll of 3/64" diameter flexible strand brass cable for metal pulleys. 85 lbs. max weight. Description: 100 foot roll of 1/32" diameter flexible strand brass cable for metal pulleys. 40 lbs. max weight. Description: 100 foot roll of 3/64" diameter flexible strand brass cable for metal pulleys. 85 lbs. max weight. Description: 100 foot roll of 1/16" diameter flexible strand brass cable for metal pulleys. 150 lbs. max weight. Description: 100 foot roll of 5/64" diameter flexible strand brass cable for metal pulleys. 300 lbs. max weight. 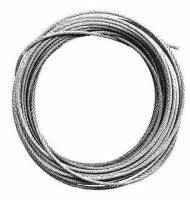 Description: Stainless steel cable is 3/64" diameter x 11 foot roll. 1/32" Brass Cable x 11 Foot Roll. Description: 11 foot roll of 1/32" diameter flexible strand brass cable for metal pulleys. 40 lbs. max weight. Description: 11 foot roll of 1/16" diameter flexible strand brass cable for metal pulleys. 150 lbs. max weight. Description: 11 foot roll of 5/64" diameter flexible strand brass cable for metal pulleys. 300 lbs. max weight.